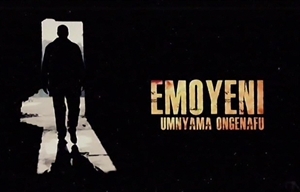 Emoyeni is a South African supernatural anthology miniseries which follows the journeys of individuals plagued by loss, fear, guilt, pain and desire whose lives are turned upside down when they encounter supernatural experiences. It was the first in a supernatural anthology miniseries strand which aired on SABC1 in 2018, entitled "Woza Nazo". The story of Kitso, a grieving widow saddled with her cheating husband's illegitimate son. Starring Nozipho Nkelemba as Kitso and Sayitsheni Mdakhi as Skhumbuzo. The story of Phakamile, a once-successful drunk responsible for his daughter going missing. Starring Mothusi Magano as Phaks and Tumie Ngumla as Kholeka. The story of Zen, a water spirit who desperately wants to be human. Starring Mandisa Nduna as Zen, Ebenhaezer Dibakwane as Kwame, Motlatsi Mafatshe as Zero and Nomonde Mbusi as Ma. The story of Bonga, a popularity-hungry fashionista running away from a calling. Starring Thabo Rametsi as Bonga, Bokang Phelane as Lilly and Ferry Jele as Mme Monare. Emoyeni was created by Thishiwe Ziqubu and Bridget Pickering and is produced by Fireworx Media in association with Ngonyama Kapital. Ziqubu is the creative producer and head writer; Pickering a producer. Dan Jawitz and Neil Brandt are executive producers. Karabo Lediga is a writer and Pheello "PJ" Makosholo a director. The title music is by Gregory Nottingham, with other music compositions by Coco Lupu. SABC1 reality show propels unknowns to global heights.